What are the Benefits of a CPU Solutions extended warranty? CPU Solutions stands behind every system we build with a 1 year warranty but we are now offering customers the choice to protect their investment even longer with an extended warranty plan that covers technical support, labor and repair work, replacement parts, shipping costs, and more. With our extended plans CPU Solutions offers customers 18 month, 24 month, and 36 month warranty covered that starts from the time you purchase your system. This means you don't need to worry about a system that's a little over a year old not being covered. Technical Support - CPU Solutions will provide technical support for issues pertaining to the hardware function or Windows related problems. ** CPU Solutions does not support training, education, configuration, or support for the use of 3rd party software or applications. We encourage customers to contact the software manufacturer in the case of issues unrelated to the hardware function or operating system. Labor & Repair - CPU Solutions will troubleshoot, diagnose and repair issues free of charge for customers within warranty. This includes diagnosing faulty parts, or troubleshooting hardware problems with a system. Replacement Parts - With an Extended Warranty plan all hardware replacements are covered by CPU Solutions. This means no additional costs to you in the event that a piece of hardware fails. In cartain cases when parts are not available CPU Solutions will issue and RMA replacement through the manufacturer to obtain a replacement part for your system. ** In the case of hardware RMAs to the manufacturer please be aware that extra time may be required to complete the repair. Shipping Costs - CPU Solutions will pay to ship back repaired systems to our customers. We do require that customers send in their system for repair, but once we receive your system if problems are found CPU Solutions will pick up the cost of shipping the system back to you. ** Please note that customers are required to cover shipping costs to send the system into us. We accept drop off at our business location if you do not wish to pay to ship the system in to us. Industry Leading Customer Service - In addition to all the services we offer CPU Solutions pledges to offer the same great service you have come to expect from us. This is a huge part of what sets us apart from other companies. If you don't believe us, give our competitors a call and see how we stack up! An extended warranty ensures all your technical and service needs will be met for years to come. Take advantage of all the great services our extended warranties offer and choose a plan that's right for you today! 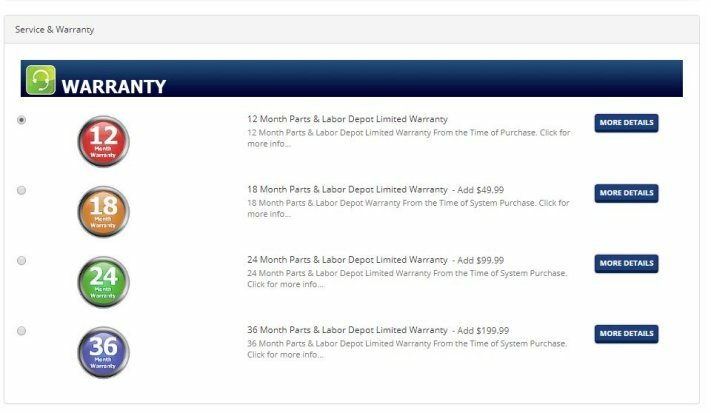 All Warranty Service Plans can be added via our kit configuration towards the bottom of the page. If you have any questions about our warranties or need any additional assistance adding a plan to your order please give us a call at (800) 474-4278.